The first button in the manual module controls section allows you to switch between adding modules in landscape or portrait orientation. 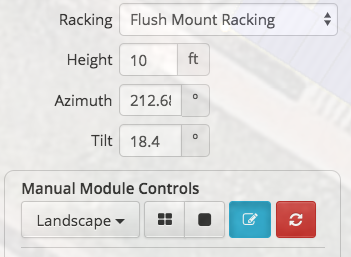 The second button in the manual module section allows you to add rows of modules. The third button in the manual modules section allows you to add individual modules to a field segment. In the animation below the green rectangle specifies any location where a module could be placed. Note: placing a module over an automatically placed module will remove that module from the layout.